With a winless conference record and a five-game losing streak, the Fresno State football team is sitting at the bottom of the West Division in the Mountain West Conference. The Bulldogs (1-5, 0-3) hope to break the losing streak this weekend when they host UNLV in their only Friday game of the season. After making his first start in Saturday’s 56-14 loss against Utah State, redshirt freshman quarterback Kilton Anderson is expected to start Friday against UNLV. Anderson finished Saturday’s game with 10 completions, 112 passing yards, one touchdown and three interceptions. The ‘Dogs started the season with sophomore Zack Greenlee, but have started three other quarterbacks since then, making them the only FBS team that has started four different signal callers this season. UNLV (2-4, 1-1) is in its first season under head coach Tony Sanchez. The Rebels are averaging 28.3 points per game, but also allowing 26.8 points per contest. The Rebels’ defense has collected 10 interceptions, but the offense has thrown seven. 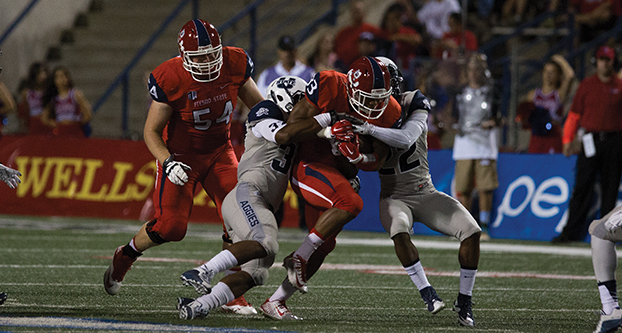 Last weekend, the Rebels lost at home in overtime against San Jose State. But the Rebels didn’t spend much time feeling down about the loss. Win or lose, they give themselves 24 hours to forget the previous game and to start focusing on the next game. The teams are hoping to take advantage of Friday’s game, which will be nationally televised on ESPN2. Although he’s excited for the national TV exposure, Sanchez said he prefers not to have a Friday game. For the ‘Dogs, Friday’s game will be another chance to prove that there is still hope in Fresno.